Our watermill and mill house were built in 1755 and, needless to say, there have been quite a few repairs done to the building between now and then. Unfortunately, some of these repairs were not done sympathetically to the building and one of the challenges facing our mill project team, is whether or not to keep them, or re-do them. In most cases they have been re-doing them. 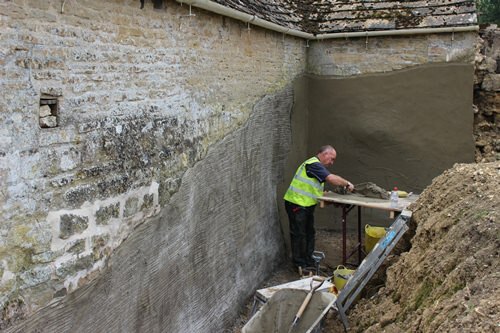 Over the last couple of weeks, they have been replacing the mortar (re-pointing) in the stone walls using lime mortar and replacing some of the re-pointing work that was done about 20 years ago. The designers have been busy re-designing the interior structure of the mill house to create accommodation rooms for potential students and apprentices once the mill becomes a centre for milling excellence. The ground around the new entrance has been levelled and at the back of the building, concrete blocks have been made and put in place to support the stone wall which was crumbling due to wear and tear from the elements. Finally, if you’ve been keeping up to date with all things watermill, you will remember us telling you that the joists in the sitting room of the mill house needed to be replaced. They have been and are now ready for the floor to be re-laid.